This year I’m going to try something different. This year I’m going to branch out. No, I’m not making a New Years type of resolution to be nicer to people or anything like that. I’m going the other direction. Following a summer defined by the still kinda sorta “un-American” World Cup in Brazil, I have decided to take up a hobby that is even more socially useless in my country: The English Premier League. Please hold on a second and let me explain. England’s top soccer division is the second-most profitable sports league in the world behind the NFL, leading to the obvious conclusion that there is something about the name “football” that attracts millions of viewers and hundreds of millions of dollars to these leagues each year. Perhaps we all use our hands in skilled activities—eating and driving for example—so much that we find hand-oriented sports to be too easy and therefore boring. But that’s definitely not it, because American football requires highly skilled maneuvers with the hands for every player except the kicker, who always appears to be a random guy, of a normal height and stature, who likes to kick things. No, there’s something else involved in the two footballs that makes them so appealing. The answer lies not in the foot. Real Madrid superstar Gareth Bale tossing the ole pigskin around before a match against Manchester United in Michigan’s Big House. It may have more to do with what I and other Americans (yes, even Americans!) have felt following the World Cup, which is arguably the greatest international sporting event there is (—sorry diehard Olympics fans. Go Michael Phelps!). Fans like me were enchanted just as much by the flair and determination of soccer stars Arjen Robben of the Netherlands, James Rodriguez of Colombia, Neymar of Brazil, and the entire Costa Rican and German teams, as we were by the valiant effort of the U.S. squad. Soccer became less about a distant foreign circus and became more about the beauty of the game and the fascinating currents of real cultural meaning pulsing through its passes, goals, hairstyles, and celebrations. We saw the mobs of fans and homecoming parties in Europe and South and North America. We got to watch former players like Michael Ballack, Gilberto Silva, Alexi Lalas, and Ruud Van Nistelrooy react to their teams’ performances on our very own ESPN. It was kind of a big, exciting, worldwide party. There was an aura about the proceedings that only a quadrennial, international competition could generate. No Major 4 U.S. sports championship compares to the World Cup, in part because a week or even day after championships are won, we hear all about next year. In the NBA, the San Antonio Spurs were immediately overshadowed by the “Where will Lebron James go?” saga following their Finals victory, for example. And more people in the U.S. are starting to feel soccer’s momentum, an important concept within the game itself for players surging ahead with the ball and teams trying win in the often-close contests. One thing that unites both versions of football and separates them from other sports is the size of the field, the opportunity to roam freely in open spaces, the potential for incredible momentum going forward with the ball in hand or foot. The aerial beauty of these sports matches the thrill of playing them. We can only imagine what Lionel Messi must feel dribbling 50 yards past hapless defenders, and compare it to the feeling experienced by Lasean “Shady” McCoy of the Philadelphia Eagles juking and sprinting past tacklers. The movement of the deft midfielder and the slippery running back appear to be similar, and both provide some of the most exciting and aesthetically beautiful plays in all of sports. In physicality and fluidity of play, the two footballs differ greatly, but the games are both defined by those hold-your-breath-did-he-really-just-do-that-he’s at the 15-the 10-the 5-gooooooaaaaaal moments. For these reasons—my affection for the beauty of the gameplay and the momentum I once felt as a new young fan of the Philadelphia Eagles and now feel for high-level soccer—I have decided to start following the English Premier League religiously, as if I had been raised on it. Am I a poser? Perhaps. But I want to see what it’s like to start cheering for a team relatively fresh and watch all of their games, every week. Luckily, like the NFL, the EPL has weekly league games, and not baseball’s excess of contests. The team (pronounced: club) that I will follow this season is Chelsea, one of the Yankees of the EPL in that they have loads of cash to spend on the world’s best players. My choice of club requires a defense of its own. Imagine this: You are from anywhere in the U.S. that doesn’t have a local MLB team—Alabama or Nebraska or San Diego (just kidding Padres fans)—and your grandparents, being the cosmopolitan travelers they are, bring you Yankees paraphernalia every time they go stay in their Manhattan apartment. You’d become a bit of a Yankees fan right? You’d feel a connection to the Yankees because you’d wear their shirts sometimes, even if it wasn’t originally your choice to support them. And the fact that they are a perennially a good team with some of the best players and most exciting personalities in professional sports doesn’t hurt. That’s exactly what happened with me and Chelsea FC. One day when I was in seventh grade, I received a package sent by my grandparents from London. Hoping it was British candy or an Xbox, I was shocked to find a blue scarf emblazoned with the words “Chelsea FC.” My dad told me that Chelsea was a London soccer team whose stadium was near my grandparents’ flat, to which I remember asking, “’This scarf is for sports? 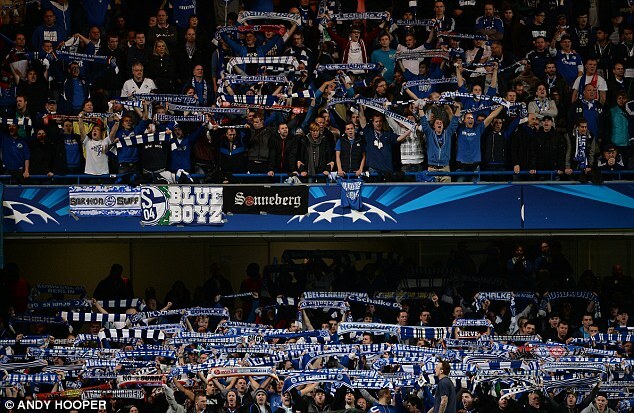 What do you do with it?” I could never have imagined back then how inspiring the images of passionate European fans raising their scarfs and singing their club’s anthems in unison would be to me in just a few years. The next year, those same grandparents sent me a Chelsea hat, which made much more sense to me. But I still wasn’t sure what this whole soccer thing was. If it wasn’t regularly on Sports Center, it wasn’t really a sport in my adolescent mind. A trip to London a year later with my family changed my worldview, which is why I am such an advocate for international travel with attention and time given to the culture of a place and doing things the locals do—rather than just the tourist activities of museums and shopping. Although my parents, the good Americans they are, were completely uninterested in trying out British soccer, my grandmother was kind enough to take me to Chelsea’s stadium, Stamford Bridge, on a match day. It was August 20, 2006, the opening match of that season, and I remember the tangible energy in the mob of people walking to the stadium together, all clad in blue and many holding scarves similar to the one I had received those years before. It was all starting to make sense. We couldn’t get tickets to the sold-out match unfortunately, but we found a little gap in the stands that allowed us to catch a glimpse of the Chelsea goal, guarded by the ageless superstar keeper Petr Cech. The ground we were standing on vibrated with the music coming from the stadium, tens of thousands of individual voices chanting for the home team as the few already defeated-looking fans from Manchester filed into the visitors entrance of the stadium. The rest of that day was probably spent at a museum or Greenwich or something else I don’t remember at all, but I do recall asking the waiter at a restaurant that night if Chelsea had won that day. It’s hard to remember the time when I wasn’t able to constantly check up-to-the-second scores among other things on a smart phone, but there was such a time, and looking back, I can recognize a magic in not always knowing what was happening in other parts of the world, in having to wait. When the waiter said Chelsea had won 3-0, I felt the excitement of being amongst the crowd all over again. The next morning I think I read every single word of the sports page in The Guardian. 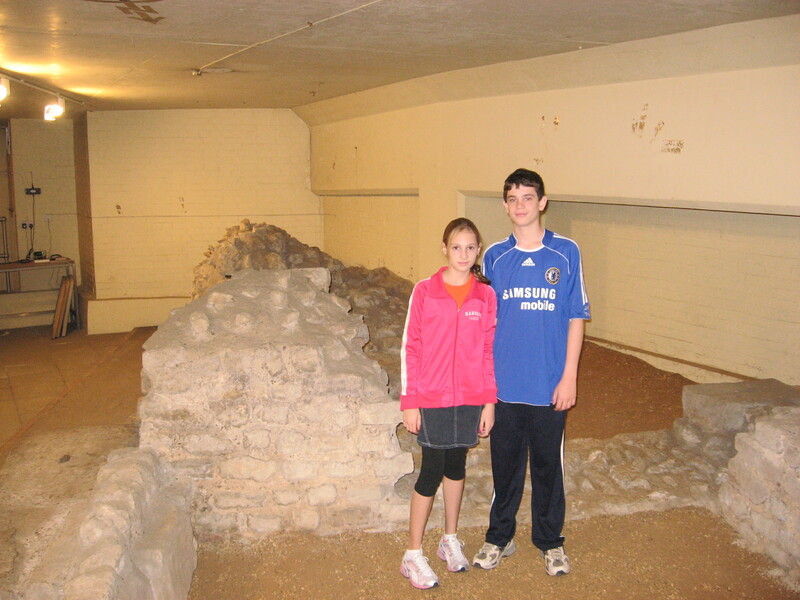 Me with my sister at the Museum of London in 2006 and wearing my first Chelsea jersey and some cool pants. To cope with the soccer withdrawal I felt back home in the U.S., I read the autobiography of my favorite Chelsea player, Frank Lampard. It was about his dad having been a great player and how he was really hard on Frank growing up and the amazing youth team Frank had played on at West Ham with all of these future England stars as teenagers and his big move to Chelsea, the club he would always consider home. Now Mr. Lampard is coming to play for New York FC in the MLS, and I can’t wait to see him live. I also can’t wait to attend my second premier league match, getting into the stadium this time, I hope. From South Jersey, I began to watch some of the Chelsea matches that trickled through to American audiences on the since-deceased Fox Soccer Channel, ESPN, and later NBC Sports. I remember the magical run Chelsea made past European powerhouses in the Champions League in 2008 and the terrible mood I was in after John Terry’s miss in the penalty shootout against Manchester United to lose the final in May. That match was the same day as my high school’s Varsity night. I was attending the banquet because I was a starter on the basketball team, but thanks to my London trip, I was also on the soccer team for the first time that year (and was terrible but loved it). The Captain, John Terry, in agony after his big miss. Coming full circle, I have decided to honor my soccer fan infancy by following Chelsea closely this year and documenting what it’s like to be an EPL fan from across an ocean. Although the team no longer has my favorite player, Lamps, they do have some of my other favorites, some of whom starred in the World Cup: Brazil’s Oscar, Belgium’s Eden Hazard, the returning Ivorian super striker Dider Drogba, and genius manager José Mourinho. Will it be easy to follow Chelsea while so much is going on around me in American sports, and my life for that matter? No. Will any of my friends care about Chelsea’s form at any point in the season or possible transfer rumors or internal discord within the team? Not at all. But it should be fun and different, a personal sports experiment and a natural continuation of that momentum I’m still feeling following the World Cup. Go Blues! consumers to easily comprehend, plan and handle data usage.